Like its beacon that shines over Traverse City, the Park Place Hotel & Conference Center has been attracting visitors since 1930. 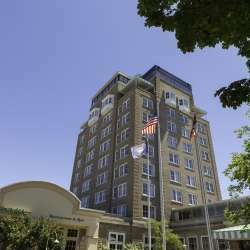 Many are likely drawn here by the uniqueness of the hotel itself, a historic landmark with 140 classically designed rooms, a new state-of-the art conference center, pool, fitness center and more. 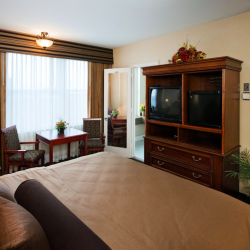 Located right in downtown Traverse City, the hotel is a favored hub for tourists, business travelers, and groups and companies of all sizes. Despite its proximity to area attractions, the hotel itself offers so much, guests may want to stay put (at least for a little while). The hotel is home to Minerva, a popular, street-level restaurant and bar that boasts a varied menu for any meals. The brand new pool and fitness center, which opened in July 2018, is ideal for guests wanting to get in a swim or quick workout. Companies and organizations will appreciate the new conference center, which can accommodate groups of up to 500 people. For after hours enjoyment there’s the 10th floor Beacon Lounge, with live music and breathtaking views of the bay and downtown.